My introduction to Dr. Kurien, came much after, i was captivated by the Amul girl and her appearance in topical advertisements. There was one hoarding, on the way to my school that was the point of discussion every week, as it kept changing. At about the same time, we in India, were recovering from a spate of shortages. Be it milk, sugar, oil, and other essentials. My father, who was at that time working for Voltas, brought home a box of Amul products, since Voltas had some marketing relationship with Amul. This then introduced me to Nutramul, a chocolate milk powder, very much like the more popular Bournvita. I feel, head over heals for Nutramul, and hold that it is the best chocolate drink i have ever tasted. I have longed for Nutramul many times, later in my life, in the US and in India. The law of supply and demand alone dont determine how and where a product can be obtained or purchased, the logistics, supply-chain mechanics, and large corporates have a bigger say in these things. I came to know of Dr. Verghese Kurien, when i was at schools for post-graduate study, and came across IRMA, Institute of Rural Management Anand. The institute and its goals fascinated me then and continue to do so today. I only wish i had seriously pursued it at that time. But given the tough entry criteria, in a land besieged with millions attempting to gain entry to a few limited seats, the possibilities were limited, if not impossible. A lot can be said and written about Dr. Kurien, and many of it is attributed to Amul. Rightfully so. But i think like the success of most brands, the real story is in the machinery that ran smoothly behind. Dr. Kurien, showed it was possible to monetize the efforts of a society, that is a cooperative society. While the Amul story transcends Dr. Kurien, it was he who transformed a village level society into a large national model for milk production, and followed it up with consumer centric products, marketing and retail models. India hedged its bets on Dr. Kurien to run the National Diary Development Board (NDDB) and replicate the Amul success across the nation. Coming close on the heals of the success of the Green Revolution, the country with the help of Dr. Kurien started the next, White Revolution. The NDDB replicated the model, that had brought about success for Dr. Kurien and his team at Amul. It created several smaller and successful cooperatives in many regions and states in the country. The NDDB launched Operation Flood, also referred to as White Revolution, which helped put India, on the top of milk producing nations. The logo on the right, may be familiar to lot of us in India. I mistook this to be the symbol to be the logo of Aavin, the milk cooperative based in Tamil Nadu. And was a little surprised when i saw the same logo used by Milma in Kerala. 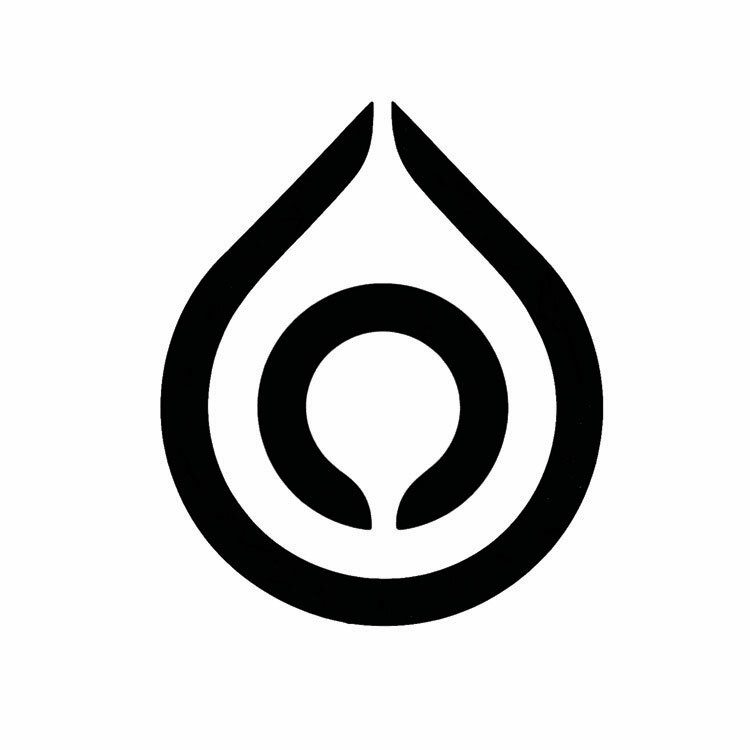 This is the symbol or logo used for Operation Flood. The logo usually appears in blue, that is blue lines in a white or clear background (on a packet of milk) with the color of milk providing the background color. India, Amul and milk production has never been the same. 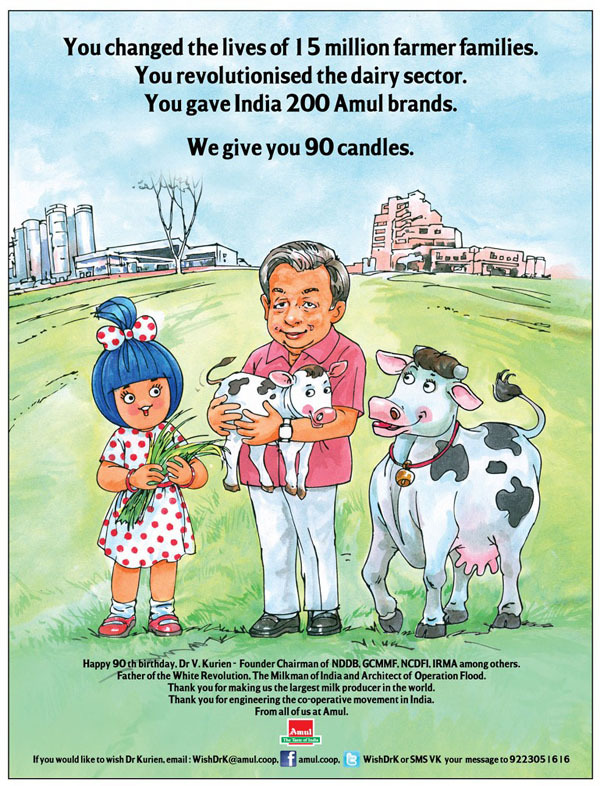 Amul brand and Dr. Kurien’s model has successfully taken on large corporates like Kraft. The story is not complete yet, and the race is a long one. Where Amul as a brand will be in a decade from now, is difficult to fathom. But the next time you sip a cup of coffee or tea, add some curd or yoghurt, simply spread cheese or butter on your bread, just think for one brief second. Many of this in India, wouldnt have been possible, but for one man – Dr. Kurien. An inquisitive mind, can find answers and always learn. Advertisements are not always based on falsehood. Couple of takeaways from this past weekend sojourn at home. It all started with a recent advertisement by Bajaj for their new campaign on the Discover bike. Among the three advertisement shown on TV, the first i saw was intriguing, it showed, what were clearly people of African native, that were speaking Gujarati, and were apparently living in Jambur, Gujarat. I quickly dismissed this as some gimmick, but the next one showed a village in Karnataka that still used Sansrkit as a spoken a language. The third i saw was the Magnetic Hill, in Ladakh, which i knew existed. I quickly presumed that there must be truth in the other advertisements too. It only took a few minutes of time on the internet to discover some interesting details. Siddi is small, but of significant size, community that now inhabits Gujarat mostly, but also in Maharastra and Karnataka, and even Kerala. They were brought to India, mostly as slaves by the Portuguese. They come from different parts of Africa, but mostly Ethiopia and Sudan and tribes spread over most of East Africa. I got most of my info from wikipedia and one represented in Pambaazuka. Their life has not been easy by any means, and continues to be an uphill struggle. Recently it appears (based on search that showed other articles) that some progress is being made. Here is one story of hope and success. This is not the first of such foreign people finding a home in India. There has been scores of writing about the lost tribes of Israel who wandered to India, as also of Chinese settlers who only know of India as their home, Parsi’s from Iran, and so on. Recently i also read an article in India Today, and later an abstract of a press briefing about a genome study conducted in India, helps show that maybe man migrated from Africa into Indian sub-continent before moving to other parts of the globe. Cursorly glance of tribes (or adivasis) in Kerala, Andaman etc., will clearly show negroid looks. But that shades in comparison to the fact that African natives like Siddi now belong to India. Their settlement in India is recent, less than 500 years, they clearly came in small numbers first, unlike a mass migration. These kinds of tidbits truly help make the statement Incredible India, a perfect way to explain or define this land. It never ceases to spur imagination or cause wonder to its own people or people around the globe. Today, i watched a movie, Parzania. 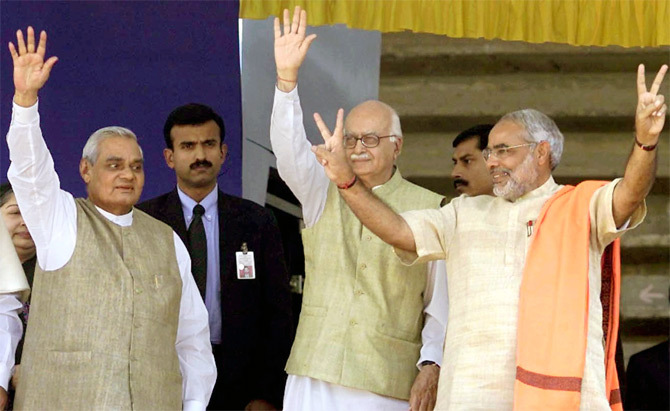 It was based on true incidents surrounding the riots in Gujarat in 2002. I had bought this movie, but since i knew the premise, i was afraid to watch it, because it would disturb me. After almost year of possessing the video disc, i finally watched it yesterday. While the movie ends with a positive note. It is surreal ending, is not so, because in life, people do manage to consume their grief and move on. This is not so much about the movie, as it is about the riots. For years now, i have been wondering why India suffers from so much of religious turmoil. Since Independence we have lost so many lives to the issue of religion and differences as perceived by the people. It has also helped fuel the cause of internal terrorism, just as it seems to have helped the efforts of terrorists from outside our borders. We have very many different reasons to fight, but invariably these differences do not cause people to do so, until they are led and powered by mobs. And these mobs are created and let loose by politicians and other criminals. After all these years of riots and investigations into these riots, we seem not able to quell it or control it. It stems, according to me, simply because the government of the time, does not have a back bone and lets mob fury dictate law and order. Government today and from the yester-years, loose their will or do not show their will to stop it from happening. Or when it happens it does not punish the perpetrators of the crime. It simply allows one injustice to overtake another, providing cover to different groups and communities. All in the name of appeasment, garnering more votes and winning the next election. The republic we call India, simply has done nothing to protects its citizens from crimes committed by the majority or the minority. Gujarat was a shame. But more importantly Gujarat was just one of the many incidents. There have been many before, and there have been many after, as recent as the one in Orrisa and now in Karnataka, in the name of indian culture. My guess there will be many more in the years to come, since no one has attempted to solve the problem. I wonder how long we will be able hide this under the carpet. Yesterday i was asked by my colleague, about an article he read in The Washinton Post, about the post-Independence violence between the hindus and muslims, as a side-effect of the partition. It was not an easy question to answer. I know it happened, few things that caused it, and how it was not controlled or stopped. I now know that the British departing from India and Pakistan, withdrew their troops and officers, very quickly leaving behind a vaccum, and also to some extend knowingly perpetuated this horrendous crime. Knowingly, because to prove to the world that India and Paksitan cannot rule by themselves, they need the British help. But he wanted to know, ‘why hindus and muslims who lived together, suddenly wanted to slit each others throats? why a few sikhs killed all the women in their family rather than let them fall into the hands of muslims? why so much of violence?’ I pardon him for asking this of me, more because he was Irish. Coming from someone else would have only irked me more. There is a lot of truth to this question, and requires some soul searching. I couldnt but tell him that the hindu-muslim divide has been going on for centuries now, and even recently in Gujarat, in 2002, the hindus wreaked violence against the muslims, in the name of revenge. Some muslim had burned a railway coach at Godhra, that killed a lot of hindu pilgrims. It was worse that a state government headed by the BJP, a hindu nationalist party, watched silently or even participated in this heinous crime. Even worse the central government, bound itself by its limitations of constitution to take action. It would appear as if, India, Pakistan, hindus and muslims cannot live with each other. A more global reader would have seen the world muslim and Islam associated with violence recently and would be tempted to believe that this one religion is the curse of the world. Nothing would be more further from the truth. As a Hindu, i am aware of the tenets of my religion, but am also not naive to think that another religion, and newer one would advocate violence and blood. The untruth regarding Islam, probably rings true because it seems to be centered around the land with the most precious resource today, oil. In this new era, it appears that the christians, another major world religion, has taken a high moral ground. That is only because, today’s christians (read white christians), control most of the wealth, power, news and resources in the world. They are done with their conquest of the world, reaching its peak last century, and so can now sit and watch the lesser beings fight it out. The Christian religion, its church and pope, have all helped the cause of its religion thru’ fair and unfair means. The crusade, the spainish inquistion, the pogrom of the new world (americas), the enslavement of africa and the KKK are all some samples of the violence the christians have inflicted on humanity across the globe. The church has not been a silent spectator, but has blessed and even instigated wars an acts of terror in the name of religion. But all this only to control resources, land, water, oil, people and other precious many commodities of yesteryears. Even the tame or humble followers of buddhism are not immune to this ability to spread and inflict violence. Many a nation who are predominantly followers of Buddhism also are home to strife, war, bloodshed and other terrorism. India home to more than four major world religions, is yet to find everlasting peace and maintain a sense of brotherhood. It appears all of us are so different and yet the same. We are of different colors and type, speak different languages, follow different religions and ideologies, belong to many nations and uphold morals that we call our own. Yet, we are all the same, we share the same qualities of greed, hatred, fear, pain and loathing. But with all this we are also able to love, share and give, behold and belong. Is it religion that separates us or is it just our basic nature.